Marine Wharf East is the exciting new vibrant destination for London’s Dockside. Ideally located only minutes from Canada Water and Surrey Quays stations, residents benefit from easy access to Canary Wharf, London Bridge and beyond. Selling Below Market pricing From £700 psf! Marine Wharf East is located in Zone 2 in Surrey Quays close to the banks of the River Thames and benefits from being in an established residential area and yet only minutes away from Overground and Underground (Jubilee line), bus, train and road transport connections into the heart of central London. Marine Wharf East is close proximity to a number of restaurants, shopping center, a cinema, a bowling alley, the picturesque South Dock Marina and the Thames riverboat service for direct quick access into Canary Wharf (in only 4 minutes). From Marine Wharf East, it will approximately take 10 minutes* walk to Surrey Quays station and one minute* overground hop to Canada Water, residents will have direct Jubilee Line connections travelling east to Canary Wharf (7 minutes*) and London Bridge (8 minutes*). Set around beautiful landscaped grounds, the site will incorporate approximately 1, 800 square metres of public open space, just one minute away from the River Thames Path Walk. Marine Wharf East comprises of total 163 units in two principal blocks, Canary Point (97 units) and Harbourside (66 units), both with residents’ lift serving all levels including lower ground parking. Thoughtfully designed to maximise on natural light, virtually all apartments incorporate a private balcony. 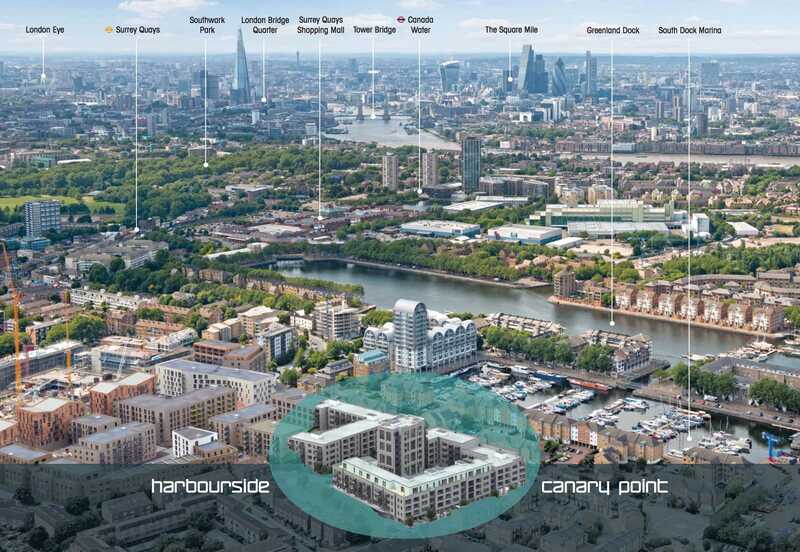 With selected apartments in Canary Point, the residents will enjoy expansive terrace space and panoramic views towards Canary Wharf, The River Thames and South Dock Marina. Situated in an enviable location at Surrey Quays, close to the River Thames and just minutes from Central London, Marine Wharf East is a truly forward thinking development by Galliard Homes. Marine Wharf East has been designed to provide the ideal balance between the fast pace of London life, and the serene environment of a relaxed home life, with green, landscaped surroundings close to the river. Marine Wharf East will provide a range of amenities and leisure facilities giving it a real sense of place and its own identity. In addition, the development’s location offers fast access to London’s world class business districts, shopping, cultural attractions and educational establishments. Galliard Homes’ development portfolio within London consists of over £1.1 billion of new development providing a mix of some 6000 new apartments, houses, townhouses, and penthouses. 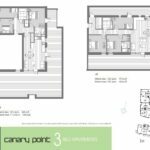 The company is now widely recognised as London’s leading developer focussing on the high end exclusive sector of residential property, located in regenerating areas identified to have long term growth potential and excellent transport connections. Galliard Homes have been building award winning properties across London, the World’s leading Capital City, for over 20 years. Surrey Quays offers an outstanding example of Docklands regeneration. From former derelict docks with a strong nautical heritage being once the oldest and busiest in the Capital, Surrey Quays now presents a colourful fusion of contemporary architecture, parkland and bustling activity centred around its two principal expanses of open water – Greenland Dock and South Dock, to provide a cosmopolitan marina, the largest in London. A short walk from the development lies Surrey Quays Shopping Centre with over 40 stores as well as the beautiful Southward Park providing 63 acres of wooded parkland, wildlife gardens and sport facilities. Residents at Marine Wharf will be within 10 minutes’ walk of Surrey Quays rail station. Following a 1 minute overground hop from Surrey Quays to Canada Water, residents at Marine Wharf East will have direct Jubilee Line connections travelling east to Canary Wharf and the O2 Arena, or west across to the South Bank, Westminister and the The West End with a typical journey time of just 14 minutes to Bond Street. 0.73km away, with 3 more within 1.5km. The development will have a communal landscaped courtyards and a Home Zone. Residents at Marine Wharf East will also benefit from the secure lower ground car parking (with additional cost). It is ideal for anyone who wants to work, study or live close to the heart of London, still be able to enjoy a calm and relaxing environment with green, landscaped surroundings close to the River Thames. Marine Wharf East comes with 2 Bedrooms and 2 Bathrooms. In addition to this, the property comes with a 73sqft balcony. Overall, you will enjoy 665sqft of ultimate luxury. 1. Booking forms, Photocopy of Passport (foreigner) & Booking Fee £2,000 to developer account. 2. 1st 10% due on/ before 21 Days on Exchange of Contract. 3. 2nd 10% payment due 6 months after Exchange of Contract. 4. Balance of 80% after completion.